...But Deliver Us to Evil! "...But Deliver Us to Evil!" is the second comic issue. Released 24 January, 2001 in the US. The Professor announces that the company has made it into Big Applet's "Best of New New York" issue for Most Efficient Delivery Company on Weekends and Holidays and they have celebratory cake. Nibbler has been overeating, including eating Zoidberg's prawns (his cousins from Ohio). Nibbler runs and hides from an attacking Zoidberg. The crew go on a delivery taking the clients, who chose them due to the award, with them so that they can see them at work. Nibbler is still missing. Ricky and Lucy are eager to know the crew's secret so Leela sends them off on a tour of the ship with Bender. Robot space pirates attack, but are subdued by Leela and Fry, then left to be picked up by the Nimbus. After the ship almost crashing a few times, Ricky and Lucy reveal their true objective, to learn from, then kill, the universe's best delivery companies. When the crew are chained up on the planet Bender requests one last drink from the stash in his chest cabinet. Ricky complies, Nibbler emerges from Benders chest (where he hid while Amy was tinkering with Bender's head) and eats most or all of the nearby Upsilons. Nibbler's burp short circuits the electro-cuffs and the crew are freed. H.G. Blob is on the cover, but not found inside. Previously unseen rooms in the ship, included on the tour, were the military strategy room, the morgue and the jungle room (Bender's favourite). Each of these contain portraits of the Professor. Planet Express needs a new wing to store Nibbler dung. The ship has a duel cabinet with white glove, pistol, phaser, sword, brass knuckle and turntable options. Professor: Excellent happenings, people! *no reaction* Whuh? Oh, now, that's not right... Let's see... Ah, yes... Good news, everyone! 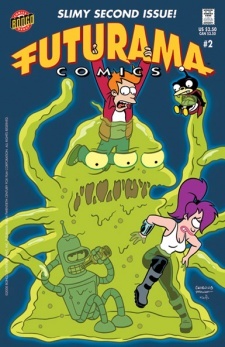 Leela: [to Bender] ...you're not here for Fry's amusement. Shorted their names to Ricky and Lucy and wore disguises resembling the wardrobe of I Love Lucy. Their names were coincidental. Members of the Upsilon species from Fedex 12, both species and planet names are based on US delivery companies (UPS and FedEx). The robot space pirate flag contains an old MacOS icon. The ship almost hits the Silver Surfer and a Galaga fleet. The Clapper-Clapper, an automatic clapping machine by Mom's Geriatric Supplies For Less. This page was last edited on 28 March 2014, at 18:21.